Women love to have soft and shiny facial skin, so it’s important to remove them through unwanted facies, in order to maintain beauty and reduce embarrassing situations. Remove unwanted facial hair with these easy-to-use wax strips. Ideal for sensitive skin , these dermatologically tested bands are made with 100% natural beeswax and almond oil softener to help protect and nourish the skin, leaving it silky for weeks. Keep facial skin smooth, soft and hair free for up to 4 weeks* with these caring cold wax strips formulated using natural Beeswax, Silk Proteins and Evening Primrose Oil. Easy-peel design, perfectly sized for small, delicate areas on the face. Includes Smoothing Finishing Wipes with Hair Minimising Complex to help slow hair regrowth and soothe skin after waxing. For normal skin. Improved formulation – smoother wax coat with fewer bubbles for more effective hair removal. Works even on short hair. Fewer hairs grow back, and are finer and softer with regular use. Removes hair from the follicle. Evening Primrose Oil nourishes and improves the smoothness of your skin, while providing it with protection and moisturisation. Silk Proteins deep conditioning effects and intense hydration help keep skin looking radiant and feeling silky soft. Beeswax is renowned for its soothing, softening and caring properties. It can also help protect the skin, keeping it hydrated and healthy-looking. Botanical-rich Hair Minimising Complex works to slow down the re-growth of hair and reduce its appearance, while softening and soothing the skin. WARM: Take a double wax strip and rub it between your hands for about 20 seconds. SEPARATE: Slowly peel the strips apart with help of the shaped end to ensure even distribution of the wax on both strips. APPLY: Skin must be dry and free from all skincare products, make-up preparations or perspiration before waxing and should be 2-3mm in length. Wax the left and right sides of your upper lip separately. Place a strip onto clean dry skin on one side of your upper lip and rub repeatedly in the direction of hair growth. REMOVE: Hold your skin taut with one hand. With the other hand grip the bottom of the strip and quickly pull the strip back on itself in one motion, against the direction of hair growth. It is very important for best results that the strip is pulled off energetically and at skin level. Keep the strip as close to the skin as possible without lifting up. Repeat Steps 3 and 4 for the other side of your upper lip. Each strip can be reused until it loses its grip. Fold the used strip and warm between your hands and repeat application as per above. FINISHING: When you have finished waxing, remove any excess wax and soothe your skin with a Smoothing Finishing Wipe. Do not use water, soap or alcohol to wipe away any traces of wax. 1. Rub the wax band between your hands for about 5 seconds. Slowly separate the bands. 2. Position the band on clean, dry skin, and rub repeatedly in the direction of hair growth. 3. Stretch and hold the skin with one hand while the other grabs the tip of the band. Then quickly pull the band in the opposite direction of hair growth. 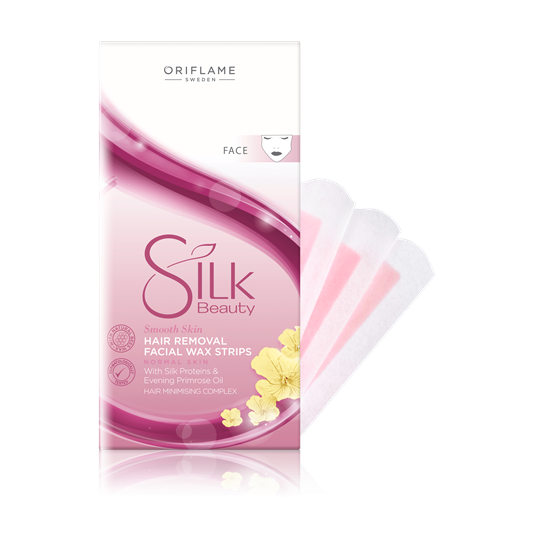 Small bands of wax to remove unwanted facial hair, and soothing wipes to remove any traces of wax. 20 bands of wax and 4 wipes.